Most of us don’t think much about identity theft on a daily basis. But of all of the things that we could potentially worry about, it is one of the most worthy of our attention. Let’s compare the average rate of identity theft to something familiar – fatal car wrecks. Most of us know someone, or several people, who have been killed in automotive collisions. But only about 30,000 people died this way in the US last year. By comparison, just over 13 million Americans suffered some sort of identity theft and fraud in 2014. Not all instances of identity theft have the same consequences. Some people will have a bank password cracked or stolen, but the institution quickly catches and corrects the problem. Other people aren’t so lucky. You may be personally unaffected, so far, but the effects of identity theft can be very severe. Sometimes, the impact is strong enough to be felt in your life for many years to come. 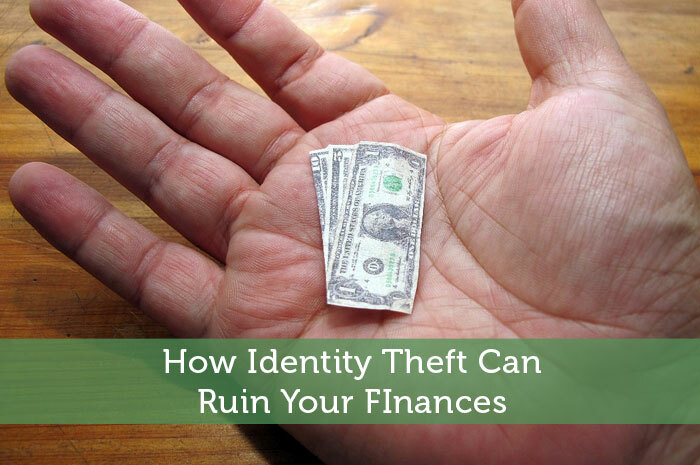 I’ve identified many of the ways that your finances can be wrecked by the right kind of identity theft. Money can be stolen directly. With the right passwords, a thief can steal money directly from your bank account. There is often little to be done about this. You may also find that illicit purchases were made in your name, using the information from one of your credit cards. Your investments and savings accounts may also be withdrawn without your consent, leaving you with little recourse. Credit Accounts may be opened in your name. Because thieves know that illicit purchases will be noticed quickly, some go the extra mile to open credit cards and other accounts in your name. The purchases they make with these accounts will, of course, never be paid off, leaving your credit score in the dirt. Depending on how you respond, you may or may not remain liable for these purchases. Your Credit Score can plummet, along with associated opportunities. If you have enough negative behavior on your credit report, even if it is carried out by an identity thief, your credit score will drop considerably. It will take months or years to recover. In the meantime, you may find it difficult to get a mortgage loan. The rates you get for loans will be much higher than if your score remained high, locking you into higher payments for a long time to come. You may even miss out on a job opportunity due to a low score. Benefit Loss is a real concern. If any identity thief gets access to your social security number, he or she may be able to draw benefits in your name, such as medical care. When you try to use your benefits, they may be used up. Criminal charges may bounce back on you, if the identity thief is charged with a crime. Of course, it shouldn’t be difficult to establish that you were not the person who committed the crime, but this still happens more than you might think. This is the sort of thing that can occur when a thief gets your social security number and impersonates you. This is just a smattering of the possible consequences of identity theft. It is important to note that identity theft tends to accumulate. If, for instance, a thief is able to break into your email, the thief will have access to lots of different passwords to many vulnerable accounts, as well as lots of other personal information. That’s why each password is important. Just think what someone could learn about you if they could access your Facebook account and messages, what other accounts they could access after successfully breaking in here. You don’t want to give an identity thief a foothold. Change passwords frequently, and make them diverse and complex. Also consider investing in identity theft protection, a service that monitors your identity and stops thieves before they can make a dent in your personal and financial life. Whatever you choose, be vigilant. Identity theft is prevalent, very likely to affect you one day, if it hasn’t already. When it happens to you, contact someone immediately. But as they say, prevention is better than cure, so be sure to take some precautionary measures to protect yourself from identity theft now.